Girls bond at the Makani Center in Amman. Makani means “my space” in Arabic. International Medical Corps’ Makani Centers provide child-protection services in an urban setting for Syrian refugees and local Jordanians dealing with war injuries, physical abuse and early marriage. My trip to Jordan with International Medical Corps gave me an opportunity to see a side of the Syrian refugee crisis that I did not expect: happiness. Whether it emanated from the faces of children at the Makani Centers in Amman or Irbid, or the new mom in Azraq camp who treasured feeling safe with her new baby, I was surprised and relieved to feel the hope provided to the Syrian refugees in Jordan by the staff at International Medical Corps. A math class at the Makani Center in Irbid. International Medical Corps’ adolescent-friendly spaces in Jordan provide young people with learning opportunities, life-skills training and psychosocial-support services. When refugees flee their homes, their journeys to reestablish stability have just begun. According to UNHCR, many can be adrift for decades before ever seeing their homeland again. During that time, they can live in tents, in crowded urban housing, with relatives or in dismal refugee camps. A young man, pictured here with his father (right), receives counseling from an International Medical Corps case manager after being sexually abused at his workplace. Our child- and youth-specific mental health programs focus on protection, psychosocial support, life-skills development, well-being and connection to resources and communities. Though Jordan has been generous in taking in large numbers of Syrians (and refugees from other war-torn countries as well), a refugee’s status once he or she resettles is always tenuous. Some left good jobs attained through higher education, but are not permitted to work while in Jordan. This causes financial difficulties and can be psychologically damaging, raising issues of self-worth. 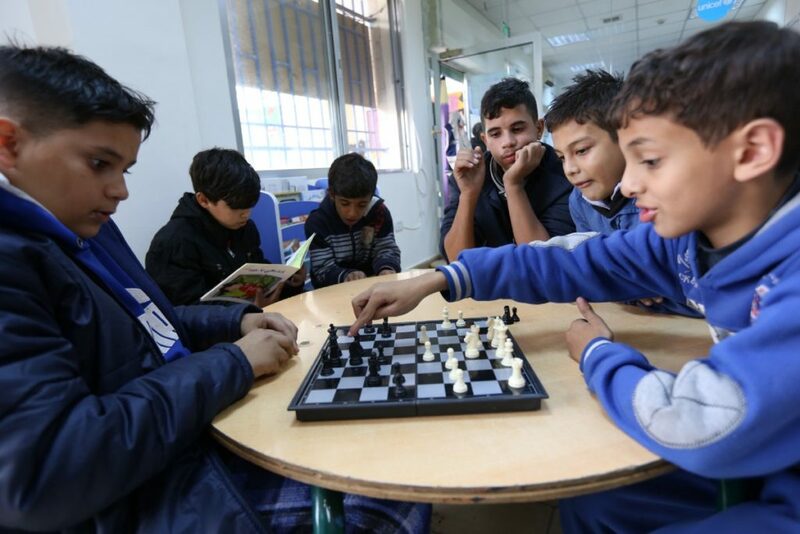 Refugee children play chess at the International Medical Corps Makani Center in Amman. Too often, in the chaos of crises, the needs of children and youth go ignored, leaving them traumatized during the most vulnerable time of their lives. The centers provide an opportunity to receive mental and emotional support from qualified health professionals, as well as a chance to play, laugh and dream like the children they are. In partnership with other agencies, International Medical Corps provides support and counseling for adults and children, along with team-building exercises and general education classes for children. Those social connections are so essential — and the children seem to be thriving. Seeing their affection for each other and for their teachers and mentors, and knowing the comfort they take in each other’s company, left me feeling hopeful rather than hopeless about their future. Ragda brings her three-month-old daughter, Miriam, back to visit the midwife, Basma Majali, who delivered her baby. Basma has been delivering Syrian refugee babies with International Medical Corps for five years. I was impressed not only by the resilience of the women I spoke to, but by their strength in the face of such great upheaval. Despite having to abruptly leave their homeland, through International Medical Corps they have been able to find some peace, support and safety. 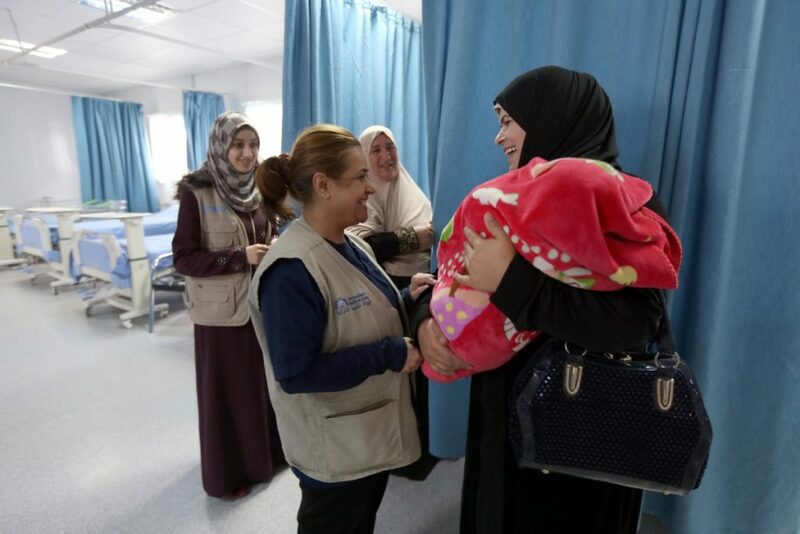 I spoke to Ragda, who brought her three-month-old daughter back to see Basma Majali, the midwife on the maternity ward at the International Medical Corps facility in Azraq camp who has been delivering babies for five years. Their obvious emotional connection spoke volumes. Ragda remembered how she cried when her baby was born at Azraq — tears of gratitude that she was safe, and tears of sadness for her lost homeland. She thought about the birth of her previous baby, near Homs in Syria, with the sound of bombs going off nearby still fresh in her memory. She is peaceful now, knowing her baby is safe. Haneen, 16, is a Syrian refugee and photographer who survived an abusive arranged marriage. She currently is living with her mother and receives support and counseling at International Medical Corps’ Makani Center in Amman. Haneen, a 16-year-old who receives counseling with her mother at Makani Center in Amman, survived an abusive arranged marriage and childbirth at a young age. She is starting a new life after divorcing her husband but losing her child to his family. Her strength and resolve to go on are remarkable. She is a photographer — we have connected on Instagram and still share photos. 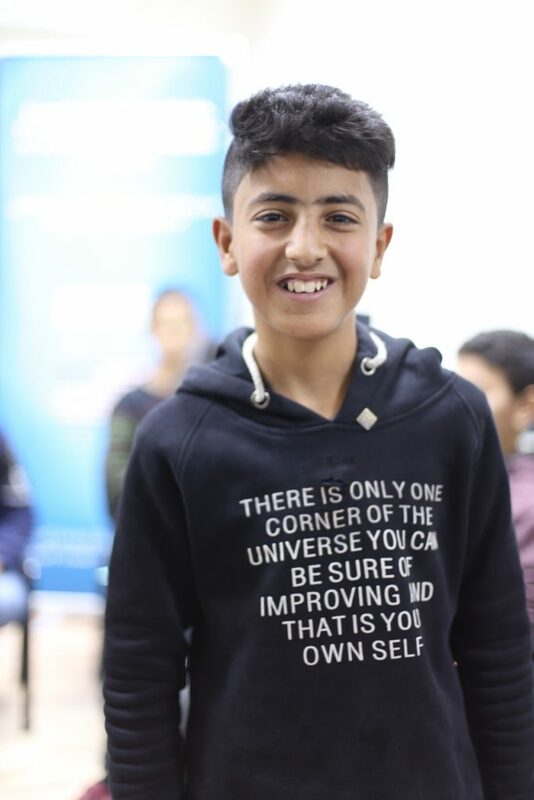 A refugee boy at the Makani Center in Amman demonstrates the resilience and hope that sustains him through adversity. International Medical Corps works to help children like him around the world who are displaced by war and disaster to maintain the health and hope they need to build the dreams they deserve. The International Medical Corps centers provided a sea of calm and optimism amidst great uncertainty. I have high hopes that those who have found their way to those centers will find the strength and skills to heal and rebuild their lives. Here, I share the images and stories that left me most hopeful.